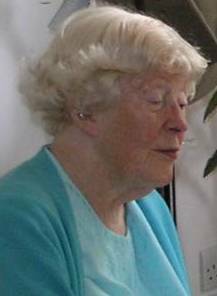 Betty Weale, who will be well remembered by most members of the HSS for providing the refreshments during the break at the HSS lectures, died on 7th February after prolonged poor health. The funeral took place on 18th February at Easthampstead Park Cemetary and Crematorium, Wokingham, Berkshire. Peter Wallis, Vicepresident, Julie Atkinson, General Secretary, and Elisabeth Fischer, ex-Membership Secretary were present. The eulogy was given by her son Graham. He gave a touching account of her life as a caring, capable and loving mother and supportive wife to her husband Robert, whose academic achievements and interests were and still are manifold. Betty herself had a teaching career; her subjects were English and Geography, but she also devoted a great deal of her time to remedial tuition, which she executed with great patience and dedication. Betty was always there for her friends and would lend an ear as well as practical advice to people who were underprivileged and was actively involved in highlighting the problems of less fortunate people. She was a great supporter of the Henderson Resource Centre and a volunteer for many years for KOVE (Kilburn Older Voices Exchange) at the Kingsgate Resource Centre. Betty enjoyed travelling and, with her husband and children, had travelled the world. She also had a great interest in the arts and music. In her busy life she found time for Tai Chi and Pilates and going for a walk. She was a brilliant hostess and all her friends enjoyed being part of her circle. As well as being a regular at HSS meetings until failing mobility prevented her, she had served on the Council in several separate stints. Apart from her family she will be missed by many people who had the good fortune of knowing her.